PALM BAY, Florida - A Palm Bay police officer is being credited for saving Long Doggers restaurant from being completely destroyed by a fire. 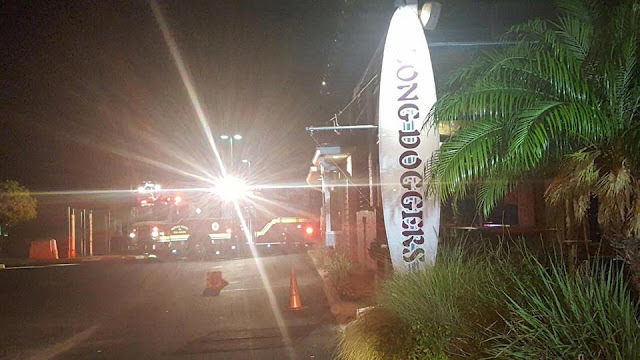 Corporal Chris Richards was on routine patrol when he spotted smoke coming from the Long Doggers restaurant located near the intersection of Minton Road and Palm Bay Road in Palm Bay, Florida. According to the Palm Bay Police Department, Richards then alerted the Palm Bay Fire Department whose quick response time and team work saved the restaurant from the blaze. After the fire was knocked down, fire crew determined that the fire appears to have started in or at the restaurant's oil fryers. Photo credit: Palm Bay P.D.